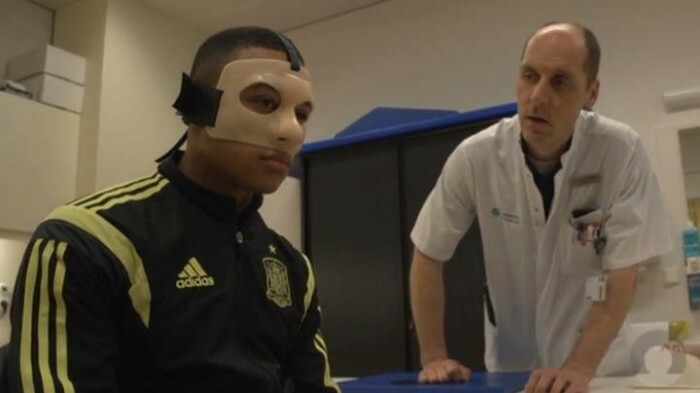 Memphis Depay, soccer player at PSV Eindhoven in Holland, is wearing an Orfit mask to cure from a crack in his eye socket, incurred because of an elbow punch during a match. “The mask will even stay put when heading a ball”, says Felix de Beer of the Catharina Hospital in Eindhoven where Depay was treated. The video and article of the treatment can be viewed here (in Dutch). In the video, you can see how the PSV’er first gets a plaster cast. A thermoplastic mask, made of two layers of Orfit Classic (2mm) is then moulded onto the positive face print and fitted onto the patient. Memphis Depay will now be able to safely play soccer until he recovers from the injury. Usually, Orfit thermoplastic masks are used to immobilize patients who are treated with radiation oncology, but the masks can also be used in Physical Rehabilitation to immobilize fractures and cracks in the face area .